Being Frugal and Making It Work: Pay for Christmas ~ Join the Swag Gems Team Challenge! Pay for Christmas ~ Join the Swag Gems Team Challenge! 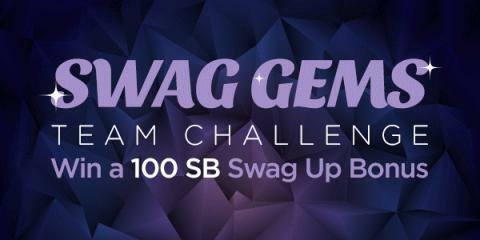 Be a part of the Swag Gems Team Challenge today to win an exclusive 100 SB Swag Up Rebate! That's 100 SB in your pocket when you redeem your next gift card from Swagbucks. So how exactly do you get your Swag Gems Swag Up? Just 2 days into this team challenge and it looks like Diamond Dynasty is in the lead but it's still anyone’s game! Remember, this team challenge doesn't end until Sunday, September 13th. There's till plenty of time to get those POINTS! I've already joined the Swag Gems Team Challenge and am a member of Diamond Dynasty. I sure hope we can hold on to our lead! Join the Team Challenge here and start earning SB in Shop, Search, Watch, Discover (Special Offers), Surveys (completed surveys AND DQs/OQs), and Swag Codes when you redeem them on the SwagButton extension (all countries) or the mobile app (US only). Not only do you earn SB towards your next gift card, but you contribute anywhere from 5 to 20 points to your team each time you earn! When you contribute at least 400 points to your team, you'll receive an exclusive Swag Up valued at 100 SB! Plus, at the end of the challenge, you'll also receive bonus SB depending on how your team ranked: 1st place: 25 SB, 2nd place: 20 SB, 3rd place: 10 SB, 4th place: 5 SB. All bonuses will be paid by 2pm PDT/5pm EDT on September 21st, 2015. The Swag Gems Team Challenge is going on now through Sunday, Sept 20th, so don't miss out! Join today! If you aren't already a member of Swagbucks, trust me... you should sign up! If you are already a member, what team are you on for this Swag Gems team challenge?